In an effort to bring awareness to plastic pollution, innovative plastics use is being highlighted in the Rio 2016 Olympic Games. From sports equipment to artificial grass and event venues, along with ribbons for medals and sculptures made from recycled bottles, plastics are being used in a variety of applications. 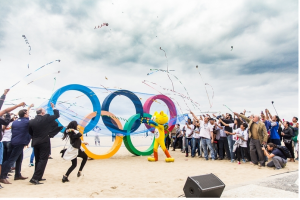 In addition, about 143 pounds of recycled plastic bottles were used to build the Olympic Rings sculpture on Copacabana Beach. Other methods for cutting the carbon footprint are being used; Including Dow Chemical Co.’s micro-foaming technology for packaging. This initiative is reported to cut 4.4 billion pounds of carbon dioxide impact at the Summer Games.